Remember back when EVERYONE was getting SOMETHING in the mail and SOMEONE was asking EVERYONE else to review their products and post about them? "Hey, Self- you have a decent following, you are pretty articulate and people seem to like what you have to say. SO WHY DONT THEY ASK YOU???" Lakeshore sent me a awesome tool for Word Families and I have been able to use it in my room for the past month! 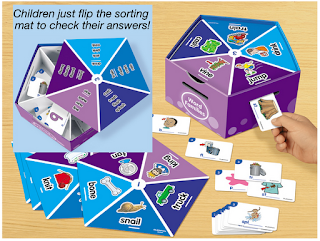 IT is the Word Families Sort-The-Sounds Phonics Box. And my sweeties have loved it! I think one of the reasons they like it so much is the self check! Even if I work on it with them in our small group, they are still super excited to take off the top, check for their cards,and make sure they are right. There are 8 sets of cards and 8 "lids" that you place on top of the box when you are working. It is so easy for them to work on their own because the numbers on the cards match the number in the middle of the "lid". After they have inserted their cards into the box, matching the vowel sound to that of the picture on the section of the 'lid", they take off the pentagon lid and check inside to see if their cards match. The pictures on the cards help to reinforce the sounds they see and hear. I had the students lay them out and list them the way they saw them on the "lid". My thinking here was for the sweeties who "get it" to do it again and for the sweeties who needed to hear it/see it again- they are repeating and continuing to match up the vowel sounds and the families. The picture below is linked to the Lakeshore Learning site and the product. If you are looking for that phonics practice you will definitely want to check this out! Thank you to Lakeshore for giving me the opportunity to review such a great product and thank you to my friends for the opportunity to share with you! I just BOOed you! I hope you haven't been boo-ed already! Stop by my blog to check it out! Ohhhhhh....I love that! I've never seen one of those before. I think I may just have to go check it out and price it...as if I need to spend another penny on my classroom. Yikes! We miss you on TT... everything alright?? I'm glad you finally got noticed! haha This looks like a great game. I do love that it is self checking! Oh ho, isn't it fun to get free stuff? But I have to ask.... were you asking yourself why it couldn't have been a box of supplies from 3M or Duck Tape or Sharpies or Bic Glitter Pens or something? How do people GET that stuff? I mean, I would be totally happy to use and review a whole big box of office supplies. DON'T THEY KNOW TEACHERS LOVE OFFICE SUPPLIES?????!!!!!!! But happy happy joy that you got some free stuff!! Nice review, too!